New M18 ONE-KEY drivers coming - Hydronics Hub | News, Product Reviews, Videos, and Resources for today's contractors. 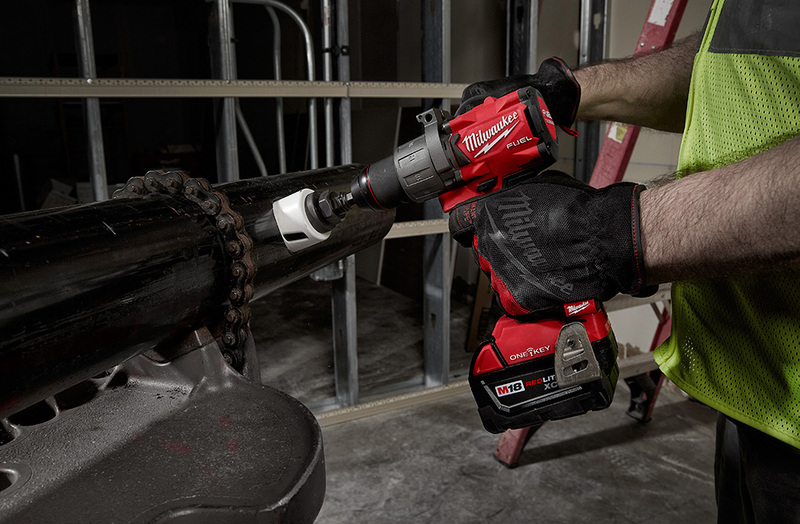 MILWAUKEE, WI- Milwaukee Tool is proud to announce that it’s taking the performance of its new M18 FUEL™* Hammer Drill, Drill/Driver, and Impact Driver to the next level with the addition of ONE-KEY™. Through a ground-up redesign of the motor, mechanical, and electrical components of these core tools, these drilling and fastening solutions achieve 60% more power, are up to 2X faster, and are the most compact-sized solutions on the market. These newest additions include ONE-KEY™** functionality so users can also easily customize, track, and manage the tools through the app on their mobile device. Accessible within the app are a range of new features such as Anti-Kickback technology and a self-tapping screw mode that automatically shuts the tool off once a screw is seated. Through ONE-KEY™, users can unlock an array of customization, tracking, and tool management functions. Anti-Kickback Technology – Both the ONE-KEY™ enabled M18 FUEL™ Hammer Drill and Drill/Driver include this feature. The mode gives users increased control in bind-up situations, and they can adjust the sensitivity of the mode based on the application at hand. This provides users with more versatility and avoids the nuisance of dealing with shut-downs during certain applications. Additionally, users can choose to turn this mode on/off or adjust sensitivity depending on the job. Improved Self-Tapping Screw Mode – The ONE-KEY™ enabled M18 FUEL™ Impact Driver features the ability for users to select the steel gauge, screw length, diameter and head. Once set, the tool will automatically shut off once the screw is seated to reduce stripping of fasteners and damage to material. Users can set their preferred task controls and, with the touch of a button on the tool, easily switch between saved tasks so each application is done with the most accurate and productive settings. Once the tool is set, a mobile device is no longer needed. Users can also access available setups based on common applications and materials. The ONE-KEY™ Integrated Tool Tracking functionality allows users to identify where and when their tools were last seen. Records and locations will update when any device with the ONE-KEY™ app comes within 100ft of the tools, allowing users to quickly pinpoint missing tools. Integrated Tool Security provides an extra layer of protection by allowing users to lock out their tools to prevent theft and tampering. With Simplified Tool and Equipment Management, users also have a central place to take inventory of their tools and all other tools and equipment and keep detailed records of all inventory to easily build a budget and manage spend. Milwaukee® is committed to improving productivity by providing performance-driven and trade-focused solutions so users can perform an entire day’s work on one battery system. The new M18 FUEL™ 1/2″ Hammer Drill, 1/2” Drill/Driver, and 1/4″ Hex Impact Driver w/ ONE-KEY™ are part of the M18™ System, now offering more than 175 power tool products, and are a true testament to Milwaukee’s focus on investing in game-changing technology that truly delivers breakthrough solutions for users. * M18 FUEL™ is engineered for the most demanding tradesmen in the world. 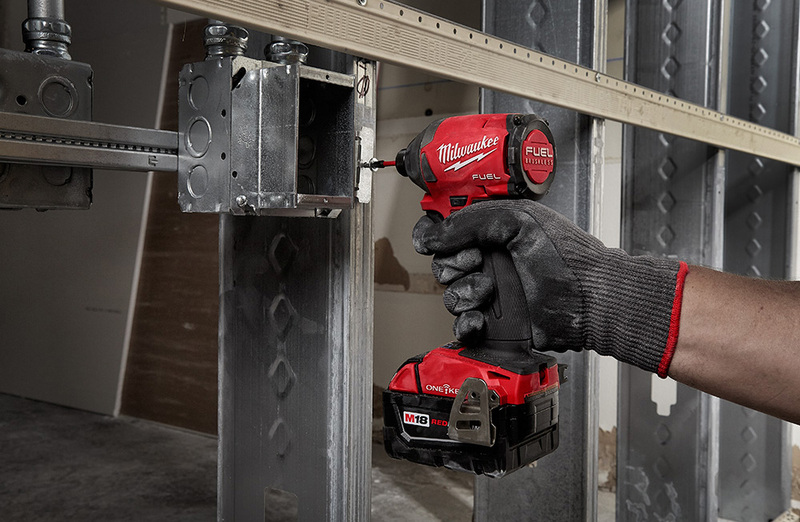 Delivering unrivaled performance, all M18 FUEL™ products feature three Milwaukee®-exclusive innovations—The POWERSTATE™ Brushless Motor, REDLITHIUM™ Battery Pack and REDLINK PLUS™ Intelligence Hardware and Software—that deliver unmatched power, run-time and durability on the jobsite. Simply put, M18 FUEL™ tools are the most powerful 18V cordless tools in their class. **ONE-KEY™ is the first digital platform for tools and equipment. By integrating industry-leading tool electronics with a custom-built cloud-based program, ONE-KEY™ provides a new level of control and access to information that revolutionizes the way work gets done. The ability to customize, track, and manage through ONE-KEY™ fundamentally changes the way users interact with their tools. Includes M18 FUEL™ 1/2″ Drill/Driver w/ ONE-KEY™, (2) M18™ REDLITHIUM™ XC5.0 Battery Packs, M18™ and M12™ Multi-Voltage Charger, Side Handle, Bit Holder and Belt Clip. Includes M18 FUEL™ 1/2″ Hammer Drill w/ ONE-KEY™, (2) M18™ REDLITHIUM™ XC5.0 Battery Packs, M18™ and M12™ Multi-Voltage Charger, Side Handle, Bit Holder and Belt Clip. Includes M18 FUEL™ ¼” Hex Impact Driver w/ ONE-KEY™, (2) M18™ REDLITHIUM™ XC5.0 Battery Packs, M18™ and M12™ Multi-Voltage Charger, Belt Clip, and Bit Holder.